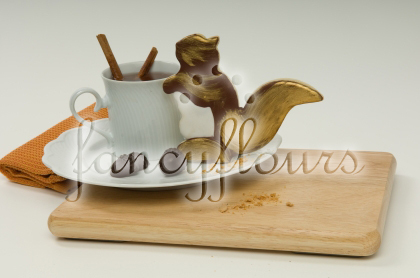 These adorable squirrel cookies are a perfect addition to your fall gatherings. To make simply use our “No Fail Sugar Cookie Recipe” noted in the Recipes section of the Blog to make squirrel cutouts. Bake and cool as usual. 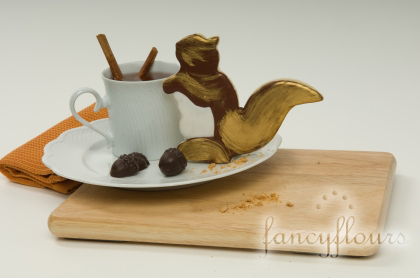 Squirrel cookie cutters can be purchased at http://www.fancyflours.com. For icing cookies, Royal Icing will give you a smooth and professional appearance. Fancy Flours sells a Royal Icing Mix that is amazingly easy to use, tastes great and frosts several cookies in one batch. Ice a layer of Royal Icing on each cookie with a squeeze bottle or a pastry bag (available at fancyflours.com). We love the squeeze bottles as they are reusable, easy for kids to use and a cinch to clean. You can dye the royal icing in shades of brown and tan to get the look you want. Let iced cookies completely dry until royal icing is smooth and hardened. Now for the creative fun! You will need a few different choices of luster or sparkle dust (several colors are available at fancyflours.com) and an alcohol base, such as clear vanilla extract, almond extract or a clear spirit. Mix a small amount of each the luster dust and the alcohol base to form a watercolor-like paste. Using an ordinary watercolor paintbrush, paint designs onto each dried cookie for a shimmering and stunning look. Let dry. Stack and store in an airtight container. Need an extra kick to your cookie tray display? Check out Fancy Flours’ selection of edible molded chocolate shapes, like the acorns seen here that are ideal for adding that special touch! This entry was posted in Autumn Baking Ideas, Instructions & How-To's by Fancy Flours. Bookmark the permalink.